Every well-equipped bicycle shop is a museum. While no historic bikes may line the walls, a mechanic’s tools record the history of the industry in their form and function. 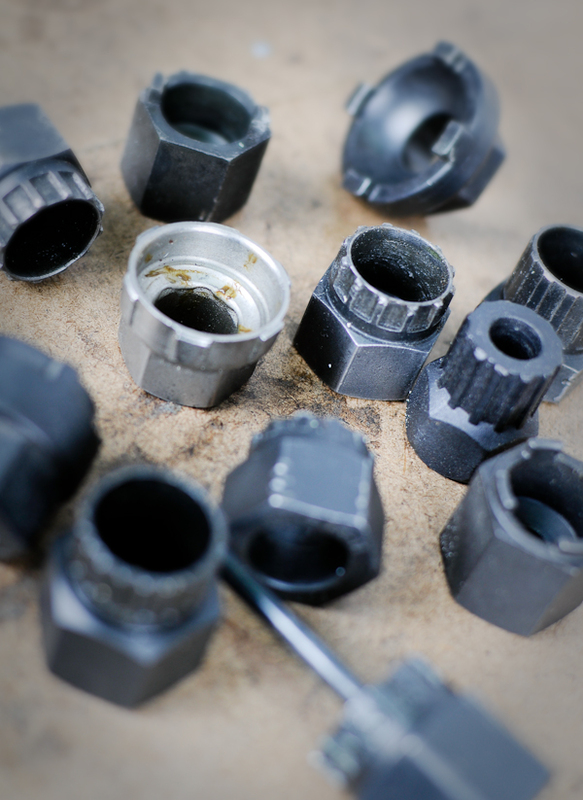 Some tools tell stories of genuine advancements in manufacturing and materials, but more tell stories of innovations derailed by market forces; of large manufacturers trying to recapture market share from smaller, more innovative rivals; and of once dominant companies trying to find their way in markets that have left them behind. Any well-equipped bicycle shop needs to be a museum because bicycles remain in service long after internecine battles are over and long after technological detours are abandoned. It is a testament to the simplicity and elegance of the machine–and to the historical sense of the mechanic–that riders expect a hundred year old bicycle to be as readily serviced today as on the day it left the factory. 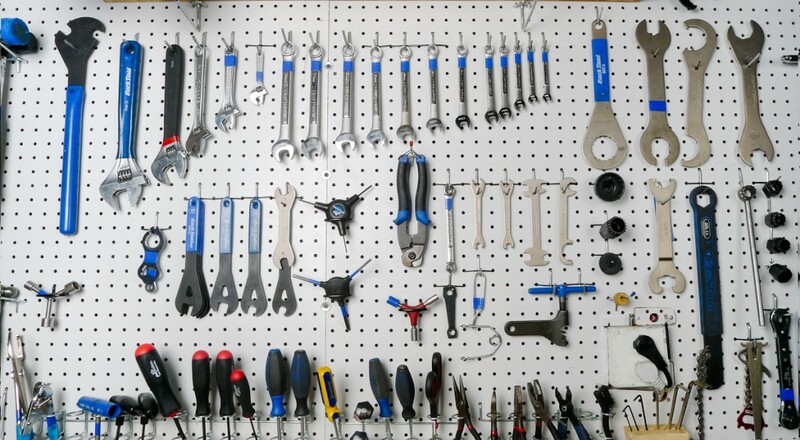 A collection of freewheel tools which remain in regular use despite the advent of the Heliocomatic system and the Shimano freehub. Cannondale introduced the BB30 bottom bracket standard in 2000. The BB30 system presses oversized bearings directly into the bicycle frame. The large interface required for BB30 bearings means companies can use larger diameter tubing and build lighter and stiffer bikes. 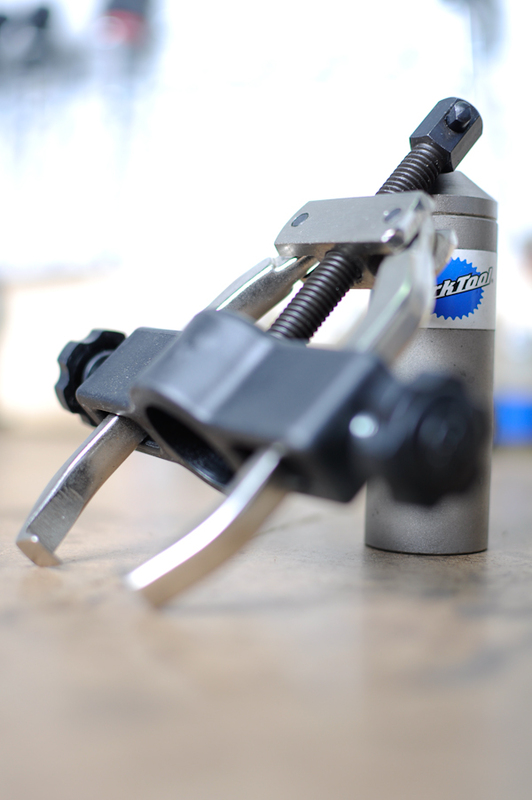 Shortly after its introduction, Cannondale began licensing the system, which is now in wide use. Because BB30 bottom brackets are not directly compatible with Shimano cranks, smaller companies such as Sram and FSA became more widely offered as original equipment on bicycles. 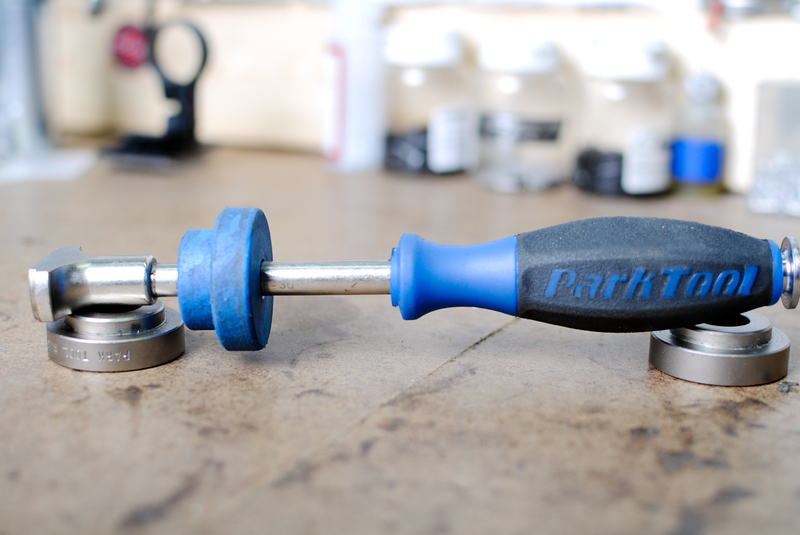 The Park BBT-30 tool and bushings, in conjunction with a traditional headset tool, are used for installation and removal of BB30 bearings. The BB86 is Shimano’s answer to the BB30. The BB86 contains bearings in cups which are pressed rather than threaded into the frame. BB86 cups have the same outer diameter as BB30 bearings, but the inner bearing accepts a narrower, 24mm, Shimano spindle. Of course, the BB86 (and the similar BB90 and BB92) require their own special tools. 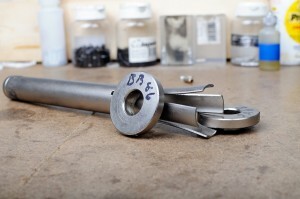 Campagnolo, which had once been large enough to set trends in the industry, no longer has the market share to dictate manufacturing standards, so they developed a bottom bracket system which would adapt their cranks to the new BB30 and BB86 standards as well as fit traditional, threaded bottom brackets. The system requires bearings to be installed directly on the bottom bracket spindle utilizing a slide hammer. Bearing removal requires a specialty bearing puller used for few other applications. The system may be inelegant, but the tools are not. 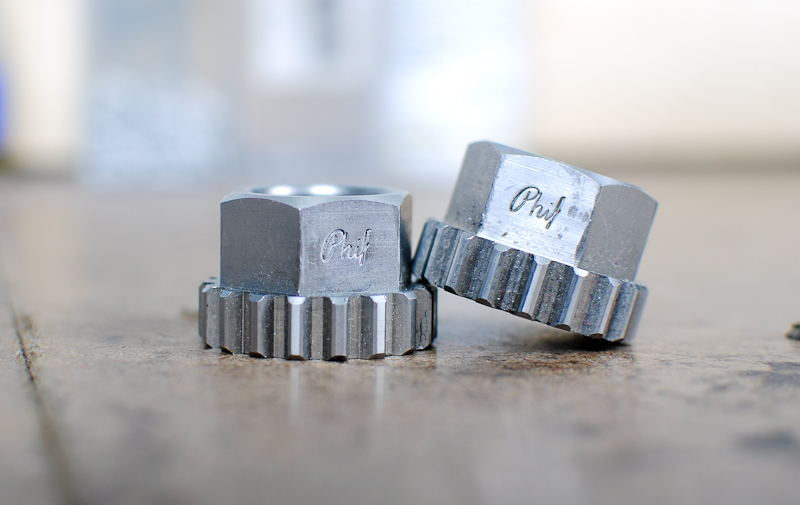 Phil Wood has designed bicycle hubs, bottom brackets, and bicycle tools since the 1970s. 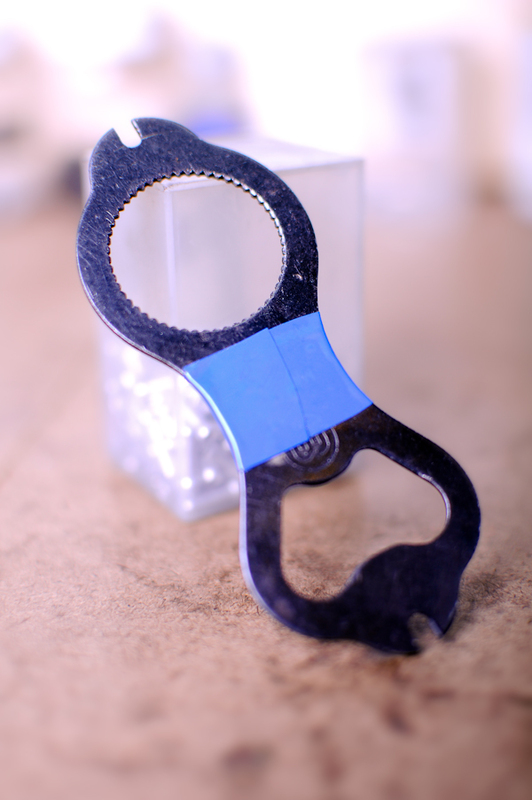 Still known for producing high-tolerance, beautifully executed components, Phil Wood bottom brackets allow the mechanic to adjust a bicycle’s chain-line (the alignment of the chainrings relative to the freewheel or cassette), something which cannot be done on modern press-fit bottom brackets. We only get to use the Phil Wood tools a couple of times a year. “Tools of the Trade” will be regular feature. Look for the next installment sometime in January.